This comes down to 11.80 cent per brick. 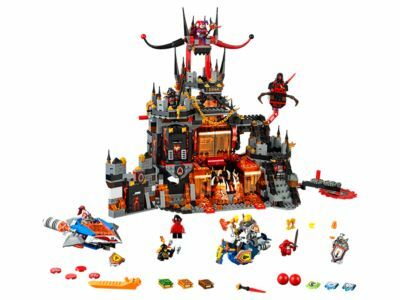 The Jestro's Volcano Lair (70323) Lego set is no longer directly available from the sites below. However, 3rd party partners of these sites might still have the set available. Alternate description Send the knights on a quest into the lair, featuring hidden traps, living quarters, Axl's Hover Horse, Macy's Mace Slammer and 6 scannable shields. Includes 10 minifigures. Includes 10 minifigures: Jestro, Bookkeeper, Lavaria, 2 Ash Attackers, 2 Scurriers, Axl, Macy Halbert and Lance Richmond. Features Jestro's Volcano Lair, Macy's Mace Slammer and Axl's Hover Horse. Volcano Lair features a detachable throne, a seated disc-shooter weapon, trapdoor function that leads into a spinning lava mouth, stairwell with spinning saw blade to stop the knights climbing the stairs, library with 2 spell books, prison cell with collapsible wall, weapon chamber, treasure room, bedroom with bed, bathroom with bathtub, and a kitchen with a chicken and a banana. Mace Slammer features a ball shooter and 2 flick missiles. Release the Volcano Lair's trapdoor, and turn the handle to plunge the victim into the jaw of the lava spinning mouth. Spin the cog handle to set the saw blade spinning and stop the knights from climbing the stairwell. Pull the prison cell's lever to topple the wall. Fire Macy's Mace Slammer ball shooter and flick missiles at the library's shield-shaped element to create an explosion effect and retrieve the spell books. Also includes the Book of Destruction and Book of Revenge. Weapons include Jestro's 2 magic wands, Axl's Axe, Macy's Photon Mace, Lance's NEXO Lance, the Ash Attacker's 2 spears, Lavaria's 2 swords, the Scurrier's axe, a sword and 2 buildable weapons in the weapon chamber. Accessory elements include Axl's helmet and shield, Macy's helmet, shield and NEXO armor, Lance's helmet, shield and NEXO armor, arat, frog, chicken, spider, banana, 2 gold goblets, and a cauldron. Scan shields for each of the 6 NEXO Powers (Flash Cannon, Fire Tornado, Wall Block, Banana Bomb, Jungle Dragon and Whirl Wind) and power up in the LEGO® NEXO KNIGHTS™ game! Jestro's Volcano Lair measures over 12” (33cm) high, 16” (41cm) wide and 11” (28cm) deep.